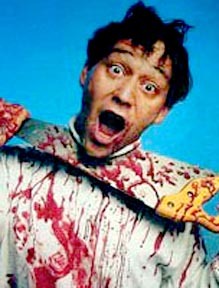 Sam Raimi is a self-taught film director, best known for the big-budget Spider-Man movies, and the more handcrafted Evil Dead films. As a young boy, Raimi looked up to his oldest brother, Sander. It was Sander who first showed him a copy of Spider-Man, the older boy's favorite comic book, and soon it was Sam Raimi's favorite too. Sander was an accomplished amateur magician, and Sam still remembers his performances at birthday parties. When Sam was 9, his brother drowned in a swimming accident. Eventually, Raimi bought a used, silent 8mm camera with his earnings from doing yard work. He started making movies, and at 13, his father gave him a new Bell and Howell Filmosonic Super 8 camera, with sound. Raimi first met Bruce Campbell in junior high school, and later took a drama class with Campbell in high school. Campbell had a movie camera, too. The boys critiqued each other's films, and quickly became friends. Raimi went to Michigan State University, where he and a few friends started a club -- the Society for Creative Filmmaking. With their help, Raimi made his first borderline professional film, The Happy Valley Kid, the story of a college freshman who snaps under pressure, and goes on a maniacal shooting spree. It played on campus for fourteen weekends -- and ticket sales earned back its costs and actually turned a profit. Raimi, Campbell, and Rob Tappert (Raimi's roommate) thought they might be able to make a living making movies. They pooled their resources, dubbed themselves Renaissance Pictures, got a loan from Campbell's father, and put almost four years effort into a gross-out horror flick called The Book of the Dead. They rented a theater in Detroit and screened the film on 15 October 1981, and the audience loved it. A distributor made a lowball offer, but thought the title was dull, so Raimi retitled it The Evil Dead. Horror novelist Stephen King was one of the film's early fans, and when King heard that Raimi was having trouble finding backers for a sequel, he rang up his friend, Hollywood producer Dino De Laurentiis, who gave him $3.6 million. With that much money to work with, Evil Dead 2 was more professional than the original. It was a moderate success, enabling Raimi to write and direct Darkman with a bigger budget, and then a third and final Evil Dead, the over-the-top Army of Darkness. Sharon Stone, of all people, was a fan of Army of Darkness, and fixed it so Raimi was hired for Stone's western, The Quick and the Dead. Raimi called it his "love poem to Sergio Leone", but the audience wasn't as interested. Raimi's A Simple Plan was a movie with no monsters and no explosions, just the dark side of human nature in ordinary people. It played in theaters for six months, was nominated for two Oscars, and established Raimi as a filmmaker whose work could connect with a mainstream audience. He was hired for Kevin Costner's last and least baseball movie, For the Love of the Game, but Raimi found working with Costner frustrating. The movie was disappointing, but Raimi had learned an important lesson: never again would he take an assignment without having a say in the casting. Raimi had heard that a Spider-Man movie was being planned, and asked his agent to get him the job, or at least an appointment. "Fat chance," he was told. "There're 16 guys they'd want before you." Studio executives, though, were wowed by Raimi's knowledge and love for the webslinger. For the lead, Raimi decided against Freddie Prinze, Jr., Jude Law, Chris O'Donnell, Heath Ledger, and even James Franco before deciding that Tobey Maguire would be Peter Parker, the average or perhaps under-average high school kid who wears the Spider-costume. Much more than Superman or Batman or other comic book movies, Raimi's Spider-Man films are about the person behind the hero's costume. But the movies are also laden with comic-book references, hidden like buried treasures for people who live, sleep, eat and breathe the Marvel originals -- as Raimi did, as a child. Some have suggested that he makes these Spider-Man films not just for the millions who buy the tickets and rent the videos, but also for the first Spider-Man fan he knew, the brother he lost as a boy. While Raimi has made his name as a director, his Renaissance Pictures -- the company that evolved out of that movie club at Michigan State -- has made its name as well. Mostly under the tutelage of longtime Raimi friend Rob Tappert, the company made the syndicated TV show Hercules, and an even more popular spin-off, Xena: Warrior Princess. Tappert eventually married the lead, Lucy Lawless. Any time you see a Raimi or Renaissance film, there are probably childhood, college, or early moviemaking pals of Raimi in the cast, or behind the scenes. Besides Campbell and Tappert, recurring names in the credits include John Cameron, Scott Spiegel, Joseph LoDuca, former next-door-neighbor Josh Becker, and Sam's brothers Ivan and Ted Raimi. Cameron, for example, was first assistant director on The Quick and the Dead, and producer on Bad Santa. LoDuca wrote the music for Evil Dead, and years later for Xena and Hercules. Becker has directed independent films like Lunatics: A Love Story and Alien Apocalypse -- and Renaissance Pictures provides the financing. Ted Raimi is now a familiar character actor, best known as the comical Joxer in Xena, but also in mainstream flicks like Patriot Games and Clear and Present Danger. The most reliable member of Raimi's ensemble, though, is a car. When Raimi was 14, his dad bought a brand new Oldsmobile Delta Royale. The vehicle has since passed into young Raimi's hands, beloved as "the classic", and it appears in almost all of his films. It was Ash's car in the original Evil Dead, it was parked outside a feed store in A Simple Plan, it was Uncle Ben's ride in the first Spider-Man, and it has appeared in every Raimi film except The Quick and the Dead (though speculation runs that the car was disguised as a wagon). "The classic" has also been borrowed for several films by Raimi's friends, Joel Coen and Ethan Coen.